Yikes! A very Busy Week, Two Chick Week-aversaries and More! 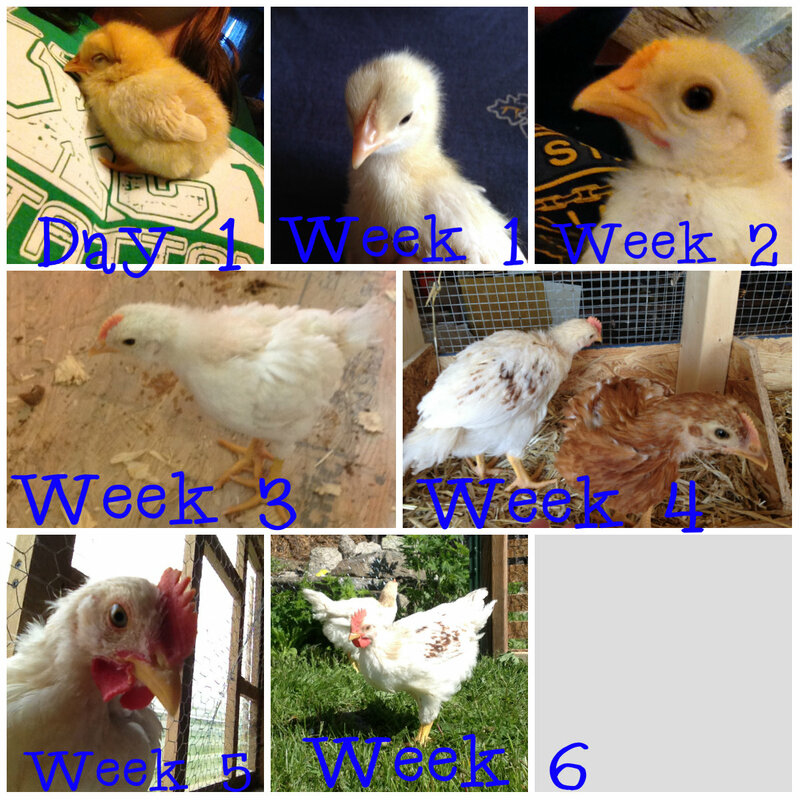 Okay, so, the last time I actually had a spare minute to blog, it was to give you all an update on my Gold Sexlinks in Week 5, as well as to tell you all about Bud, our very special chick. Well, it’s been a busy week for us, filled with chorus concerts, canning (I made homemade jam), eye doctors appointments, and a weekend picnic. In short, I haven’t had time to sit down and upload pictures or write a quick post. 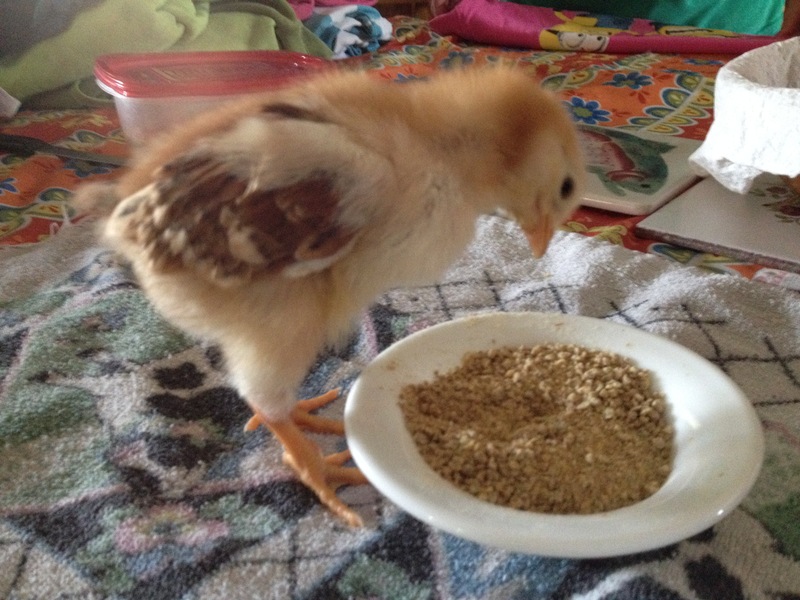 So… we’ll start with the Rhode Island Red chicks, who celebrated their 2-weekaversary with us on Wednesday. Week are two weeks old and hard to catch. They’re still adorable, but very active and hard to catch. 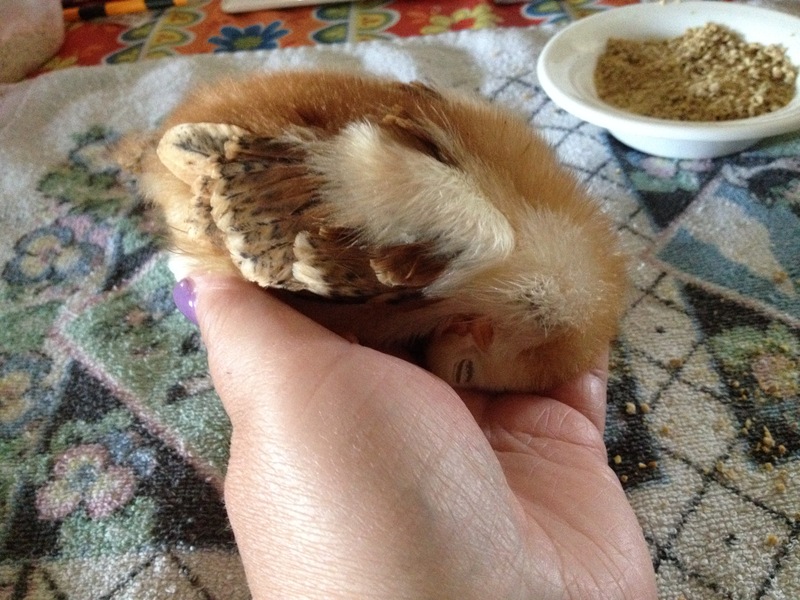 They’re also getting tons of feathers, running around the brooder box like crazy things, and trying to fly. Meanwhile, in the house, there was Bud, our very special chick. This is Bud. This is how he looks on Tuesday, 4 days after we brought him into the house. Here he is, doing a fairly decent job holding his head up. I have to admit this, right up until Thursday, I honestly thought Bud was not going to make it. He held his head up a little bit, to eat, but crumpled up like a ball right afterwards because it was too much effort to maintain an upright position. Thursday saw a HUGE marked improvement in his health and overall demeanor. He started holding his neck straighter, walking forwards more, and eating more. Yesterday, we made the decision to bring Bud back to the rest of his brothers in the brooder box. I was worried that they might not accept him, given that he’d been int he house for a week, and possibly smelled like human or cat. (We have two house cats.) But no, they didn’t even notice I’d added an extra chick. Bud integrated easily, and this morning he’s eating and running around with them like he never left. He still holds his head tilted to the side a little, but I haven’t seen him dragging it on the ground like last week. What a difference a week makes! I’m so glad we decided to wait it out and not make a rash decision. Here we are, exploring our run. The door is open at last. At the same time Bud was reintegrating with the rest of his flock, my DH was hard at work building the run where the Golds (now 6 weeks) will be spending some recreational time. We’ll keep the run gated for the next two or three weeks, until they are all used to it and happily coming and going as they please. They were hesitant at first, but gradually, they made it out in little bunches of two or three. 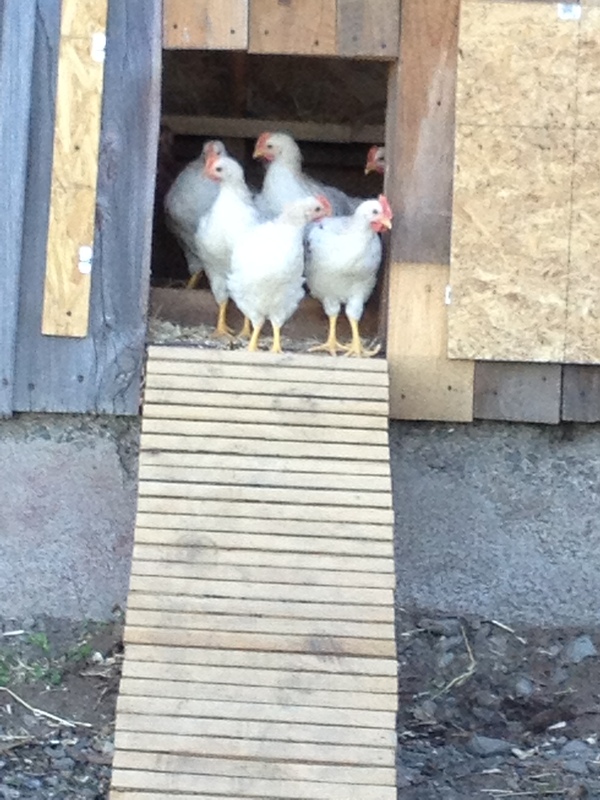 We’re leaving their food and water inside the coop, so they know where to come back to get it. Later this week, I hope to set up a dirt bath area, but there is plenty of dirt and rocks, as well as green grass and flowers to explore. Most of them seem to like it. Glad to know that Bud is doing well. You just never know how they will come out, but your hesitation paid off. I’m glad, too. This morning, I couldn’t look in on him and tell him apart from his brothers because he’s doing so much better holding his head up and getting around great. He just needed that time to get stronger, I guess.